1.Annamaya Kosha (Food Sheath) The first kosha is associated with the material fraction of the body, which needs food and water to subsist. It comprises the physiological and psychological gross processes. Gross since there are two sides of this psychological level, one related to the physical brain which keeps memories and traumas, as thought images and the pranic level, which goes deeper. These thoughts somehow get stored in the pranic kosha and get transmuted into emotions. From an Indian standpoint, the human structure is examined via the ayurvedic doshas, which portray both, the general body type as well as its present state. For example everyone is made up of a combination of the three types of doshas: vata, pitta, and kapha. The three doshas encompass the five universal elements: 1. space 2. air 3. earth 4. fire 5. water [Vinai’s comment: the usual order of the mahabhuta’s is: space, air, fire, water, and earth] Vata is a mixture of air and space. Pitta is 95% fire with some water. Kapha is 90 % water with some earth. Well-being and happiness is the end result of keeping these doshas unprejudiced. Any discrepancy amid the tri-doshas can be the origin of upheavals and disease. Diet, yoga, good digestion, breath and elimination of toxins can bring about equilibrium of the tri-doshas. 2. Pranamaya Kosha is the home of the subconscious ego, which uses an intricate network of cylindrical channels to move about, together with the vital force. This sheath intermediates, connecting the body and the three sheaths of the mind (outer mind, intelligence and inner mind). 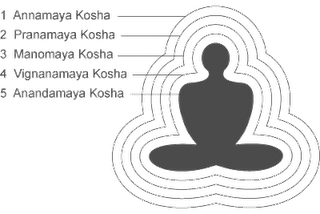 It is also in between the five gross elements and the five sensory impressions.Pranamaya Kosha exists in the physical body and also the pranic or astral body. Its pranic meridians are connected to the nervous system and it flows through the blood and lymphatic vessels as well. The breath is the primordial connection and sustenance of this sheath. This shell continues to exist after the physical body expires, briefly for it is ephemeral. 3. Manomaya Kosha: Mano means mind, which presides over the faculties of awareness and instinctual perception. The mind can create and obliterate anything it wants, but it is multifaceted and divided. The mind has three segments: the conscious mind or waking state, the subconscious that is shaped by negative and positive incidents, while living life in the world, (these impressions get codified and stored in the subconscious mind. Here is where our identity and personality developed with its complex and elaborate behavior, conduct and sets of rules) and the unconscious mind, which is expansive and empty, and it is connected to the collective unconsciousness and the world of archetypes, which Carl Jung described in great detail in his books. 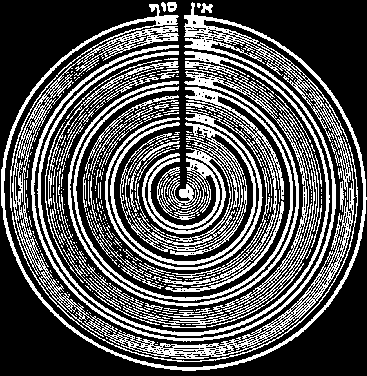 Within this sheath, events take place mechanically. With Yoga Nidra techniques, our mind can be penetrated and reprogrammed into a more positive and light mind. 4. Vijnanamaya Kosha: Vijnana means intellect, which discriminates, decides or intends. This sheath is the amalgamation of intellect and the five sense organs. It bestows the individual soul with the concept of individuality. This is the sheath of budhi that together with the pranamaya kosha makes up the subtle body. It constantly identifies itself with the physical body, and exactly here is where the eternal soul makes the mistake and assumes an identity and a time frame of existence. It is where death comes into the picture, forgetting in some strange way who or what it really is. It is the place where a superimposition takes place, in other words is here where the misidentification with time and form coexist with the the all pervading self. We have to remember, that even though this layer of consciousness is amazingly complex and mesmerizing, it is subject to alterations, it is not eternally present, it is insentient, and it is restricted. We could use this sheath as a bridge to moksha or liberation from the mind and ego, nevertheless we should not confuse it with the goal. This is the intuitive expansive sheath, it is aligned to thethe causal body. Some schools of thought state that Anandamaya kosha is not a sheath as are the other 4. They claim that It is none other than the soul itself, a body of luminosity, karana sharira as it is named in the scriptures, It is the holder of karmas of this and all past lives. Other teachers however state that anandamaya kosha is the last sheath and that it should not be confused with the real self. Here in this sheath the practitioner experiences bliss and ecstasies. The soul embellished and seduced by the sensations, forgets about itself, falling prey again and again to duality and ego gratification. At this juncture the ego in conjunction with the soul perpetrates individuality. Anandamaya kosha survives death and evolves through incarnations. Then anandamaya kosha develops into Sivamayakosha or the expansive all pervading vastness. 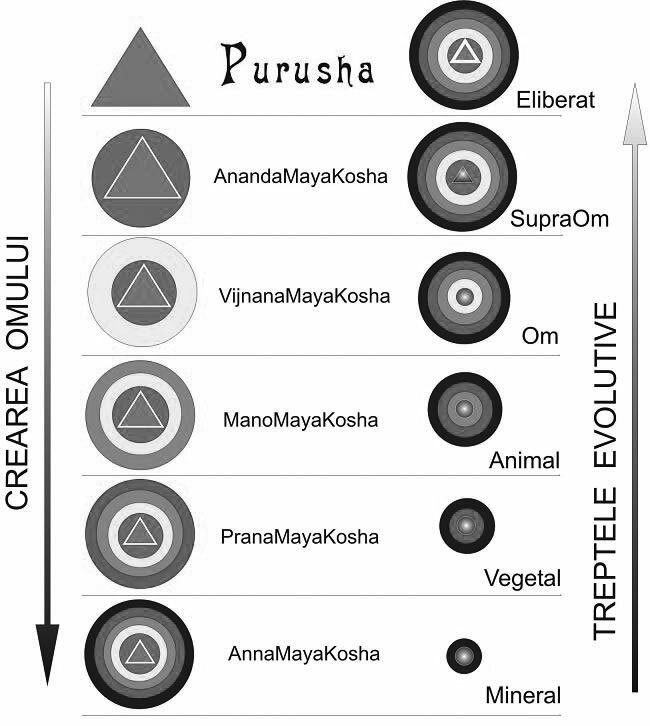 The physical body (annamaya kosha) is also called sthula sharira, or material body. Pranamaya, manomaya and vijnanamaya koshas jointly encompass the sukshma sharira, “subtle body,” or “astral body”.